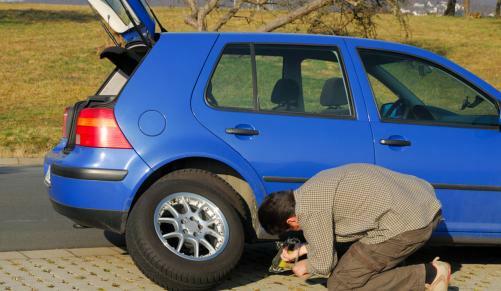 16 actions you should take when your car suddenly breaks down on the road. Modern cars, especially if well-maintained, are amazingly reliable, but when something does go wrong it always seems to happen in the worst possible circumstances. Rory Judd, head of online marketing at MiWay, gets to hear these stories all the time, about how his clients' cars only seem to give trouble in heavy traffic or on the open road. That's not as paranoid as it sounds, he says, because your car's cooling system works hardest in slow-moving traffic, while the tyres take strain at sustained highway speeds, especially on a car loaded down with midwinter school holiday travellers and their luggage. "You should work in advance out what you're going to do if something goes wrong," he advised. "It's easy to make a wrong decision in the heat of the moment." 1 Don't dive for the shoulder of the road; you could put yourself or other road users at risk with sudden unexpected braking or lane changes. 2 Stay calm and make all the routine checks to ensure the coast is clear before moving to the side of the road. 3 If you see your car's temperature gauge going up, turn off the car's air-conditioner and open all the windows to reduce the load on the engine. 4 Then turn on the heater; it takes heat from the engine to warm up the passenger compartment - and taking heat from the engine is just what you need. 5 Try to drive as smoothly as you can, using the brakes and accelerator as little as possible. 6 But if the needle keeps heading for the red zone, or the engine begins to sound stressed, you are going to have to pull over. 7 Look for a safe spot, and remember other motorists don't know about your problems, so you need to make all the usual checks and signals, before getting as far off the road as possible. "Before you even think about getting out of the car," Judd warned, "put on the parking brake and hazard lights. 8 Open the bonnet from inside the car, don't do it manually because you could get a nasty burn." 9 Leave everything to cool down while you put out a hazard triangle (which you are supposed to carry by law) - but only if you can safely walk a few metres away from the car without getting knocked down! 10 Check whether your coolant tank is up to at least the minimum level; if not, said Judd, the chances are it's leaking or the radiator cap isn't sealing. 11 Carefully remove the cap, using a cloth to protect your hands, and top it up with the water in your designer gym bottle. 12 Drive slowly to the nearest mechanic. 1 Don't try to change the wheel if you have to stand in the road to do it. 2 Working on the side of the car away from the traffic should be safe, but changing a wheel on the traffic side of the car is a not a good idea unless you're well off the road on a really wide shoulder. "Rather stay in the car with the windows closed and doors locked," Judd said, "and call a friend!" 3 The same applies if your car has a problem you can't fix; keep your roadside assistance service provider on speed dial. 4 And while you're on the phone, don't forget to let friends or family know where you are and that you might be delayed.